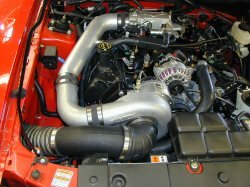 Paxton 1999 4.6 Mustang GT ystem N2000 Satin Finish  : Supercharger Superstore, Your Online Source for Vortech Superchargers, Paxton Superchargers, Procharger Superchargers, Magnacharger Superchargers and Techco Superchargers! Please note: Adding the optional charge cooler (1300001) to these systems will require ECM programming and could require additional parts, consult your Paxton representative. 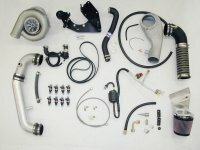 Tuner kits do not include the fuel pump, fuel injectors, or ECM chip/tuning. Power output could be greater with custom tuning on higher octane fuel. These systems are calibrated using 91 octane pump gas to meet 50-state smog legal status. *Supercharged horsepower and torque data shown is a calculated estimate based on percentage increases from actual rear wheel hp/tq measurements.